Time to make room for new vintages at Wine.com! 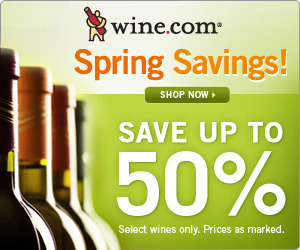 Save up to 50% on select wines; no coupon or promo code needed. Stock up now for best selection. Prices as marked on the Spring Clearance Sale page. Hurry! This sale ends April 9th, 2010. Visit Wine.com for more information.